The Lompoc man accused of abducting his ex-girlfriend in Solvang was spotted with her Sunday morning at a Starbucks in Arizona, according to the Santa Barbara County Sheriff’s Office. After the Lompoc woman sought help from a customer in the coffee shop, the suspect pulled her out of the Starbucks and back into a vehicle in which he sped off. Authorities did not manage to track down the vehicle, and the manhunt is ongoing. 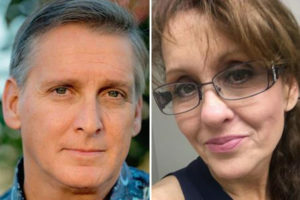 On Friday afternoon, officials received information that Joseph Hetzel, 52, allegedly kidnapped his ex-girlfriend, Virginia Paris, 55. Detectives believe Hetzel and Paris drove south from Solvang on Highway 101. They were last seen in Ventura County prior to popping up in Arizona. Hetzel has a violent history that includes using explosive devices with the intent to terrorize, felony vandalism and criminal threats. Hetzel has access to firearms and is considered dangerous. Around 7:15 a.m., Paris and Hetzel were spotted at a Starbucks in Goodyear, Arizona. When Paris ordered coffee, she gave the name Virginia to the Starbucks worker taking her order. Paris then went to the bathroom, and when she came out she told a female customer that she needed help. Hetzel saw the interaction, grabbed Paris, and dragged her out of the coffee shop. Hetzel then kicked Paris into a vehicle and drove off at a high rate of speed. While Hetzel was driving away, Paris threw her car registration out the door. Goodyear police officers recovered the registration. The paperwork shows the vehicle being used in the abduction is Paris’ black 2015 Chrysler 200 with California license plate number 7NGE514. Witnesses last saw the vehicle entering the I-10 freeway heading eastbound toward Phoenix. Santa Barbara sheriff’s officials are working with Goodyear police and other Arizona authorities to locate Paris and Hetzel. Arizona law enforcement and media have received a description of the vehicle and photos of Paris and Hetzel. The sheriff’s office is also working with the FBI. Sheriff’s officials say they are deeply concerned for Paris’s safety, and they are dedicating a large amount of resources to the case. Anyone who has information about Paris or Hetzel’s whereabouts is asked to call 911 or the sheriff’s anonymous tip line at 681-4171. Authorities instruct anyone who sees Hetzel not to approach him and to call 911 immediately. Half of them probably never looked up from their laptops, iPhones and caramel mackalockas or whatever they call those silly overpriced drinks. You try and drag a kicking screaming woman on the ground out of a store and lift her into a car. Remember, she’s in no worse off situation than she’d already be. The willingness of posters here to look for excuses to do nothing is really appalling. What a bunch of cowards. She’s been found safe, apparently dropped off somewhere. Suspect is still on the loose.